The Friends group runs a volunteer trail work, planting, or tidying up morning session on the first Saturday of each month, with participants meeting at the Merriebrook Bridge at 9 am. On Saturday, July 6, only a few volunteers turned up on a very hot and buggy morning but they achieved a lot. Some volunteers picked up trash, which unfortunately gets dropped around the Red Barn, cut grass and weeds, and generally tidied up around the building. 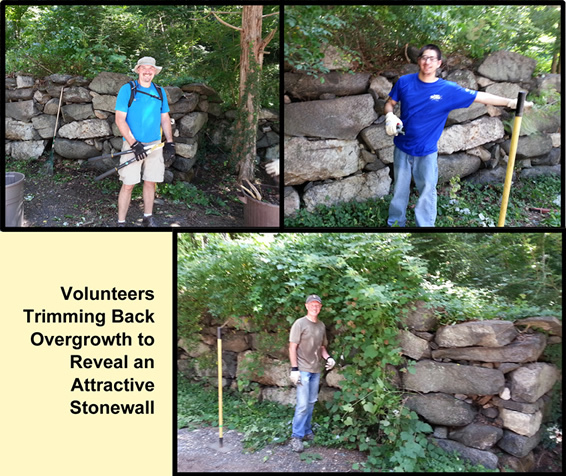 Others worked to clear weeds, vines and trash from the wall on the eastern side of the parking lot revealing some attractive stone work and really improving the appearance of that section of the lot. More work will be done there in the near future. Early this summer, Emilio Funicella, a local Stamford resident, started acquiring plants and gradually created a terraced landscaping around the lower parking lot, between the Red Barn and Merriebrook Lane. Manpower was provided by volunteers, including many from the Liberation House Program. Park visitors frequently praise his work. Not only are the plantings worthwhile visually*, but also they steer visitors to the path created by the Student Conservation Association, thus reducing erosion of the hillside. This summer's drought presented a real challenge to sustaining the plantings. Emilio managed with volunteers, water trucks, and finally a water line from the Red Barn, to keep the plants from dying of thirst. Finally, Emilio also coordinated the installation of surplus Stamford park benches, for visitors to rest their weary feet while enjoying the plantings. His passion and ability to get things done and his willingness to volunteer repeatedly were recognized in December 2009, when Domus honored him as a local hero. * Although Emilio planted a few plants that are on the Connecticut State list of Banned Invasive Plants, we have worked with him to avoid that in the future, and those invasives were removed.